I've been working on and off for three days on my Nine patch swap blocks...finally finished, ironed in between phone calls, kids screaming (playing hide n seek) and I sighed a big relief as I've completed something! Finally!!!! I always measure to ensure all the blocks are accurate and what do I see a 1/4" difference on one side. The middle strip centre square was cut @ 2 1/4" instead off 2 1/2"......... What's a girl to do??????? Turn off the iron, sewing machine, and the light and casually walk out of the sewing room and make a cuppa. OMG you must be soooooo patient Deb...I'm sure it will all be worth itin the end! 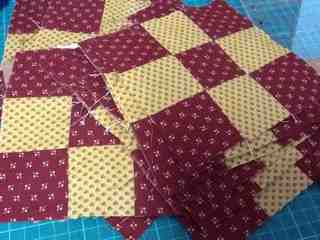 Oh no...I take my hat off to you unsewing 16 blocks...I would have probably gone mad with the scissors. Hope you enjoy your movie. Blast! Don't you hate that, but what else can you do than fix them up. I had a measure twice, cut once lapse with my place mats, but it was less time consuming to fix. Good luck with your second attempt. Oh no, what a pain. Hang on, I thought we had to do 14? a cuppa!! Hope it goes better for you next time round. Oh dear, you are very patient to unpick 16 of them! I guess it's still quicker than recutting and sewing the whole lot again... hope it went to plan.